Some properties have an almost perennial popularity. Street Fighter, for instance, has been kicking around video arcades for almost two decade, and toys have always seemed to follow in its wake. Hasbro was first to give us Street Fighter toys, in their 3 3/4" GIJoe line. ToyBiz took a crack at a few of the characters in their 5" X-Men vs. Street Fighter sub-set, and then the late, lamented ReSaurus created a 7" line in 2000. Palisades was supposed to offer a line that picked up where ReSaurus left off, but they couldn't work out mutally agreeable terms with Capcom. But now Chun-Li, Blanka and the rest are back, coming to us from SOTA. 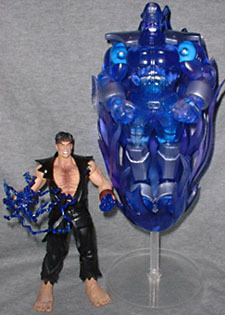 To preview their new line, SOTA offered an exclusive two-pack, limited to 2000 pieces, of Evil Ryu and Psycho Bison at the summer conventions of 2004. You can't go wrong stacking the deck with bad guys right away, especially when they're so cool. Evil Ryu is the rage within Ryu, unleashed in the malevolent style of Dark Shotokan. He was unable to control the bombardment of Akuma's power he inherited leading to this. Though he is consumed with violence, Evil Ryu is trying to control himself and confront Akuma in a final battle to kill him once and for all. So for those who didn't understand all that, Evil Ryu is regular Ryu gone evil. Amazing! The "hero" of the game, Ryu is a martial artist dedicated to perfecting his body and technique. He constantly travels from place to place around the world, looking for opponents worthy enough to challenge him. At some point, apparently, this quest saw him possessed by an evil force that he had to struggle to control. Not the most original plotline, but it's fairly complex for a late-90s videogame. 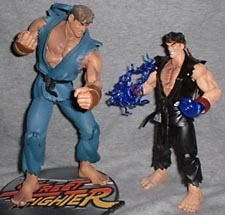 To signal his turn to the dark side, Ryu changed from his usual white gi to a dark blue, and that's almost what this version of the figure has. There's going to be an Evil Ryu in the first series of figures, but the colors on this exclusive version are darker - a black gi and dark red wristbands. The head sculpts are different, too, with this Ryu exposing his teeth in a wicked grin. SOTA is following the Marvel Legends model for these figures: a 6" scale and tons of articulation. Evil Ryu moves at the neck, shoulders, biceps, elbows, wrists, hands, torso, waist, hips, thighs, knees, ankles and toes. Though it looks like he should move at the point where his legs poke out from his pants, he doesn't. 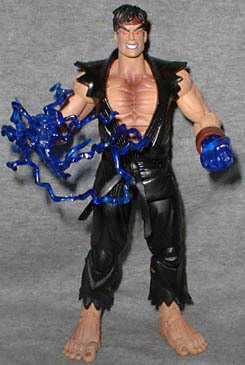 His fists are cast from translucent blue plastic and are crackling with lightning bolts to show his fearsome power. While the regular figures will have interchangeable heads and hands, this exclusive does not - however, this is the only place to get the "crackling" fist. Part of the beauty of this figure is the amazing detail: not only do they have the big red kanji painted on his back, but they also thought to include the fuurinkazan on his belt. Rather than just painted elements, the fuurinkazan is actually a molded part of the belt, which shows a great attention to detail. Fuurinkazan was the motto of Takeda Shingen, a warlord in feudal Japan, and is made up of four kanji: kaze (wind), mori (forest, though they've only got two of the three trees usually used to represent it), hi (fire) and yama (mountain). The words were taken from chapter seven of Sun Tzu's Art of War, or Sonshi: "In war, practice dissimulation, and you will succeed. Whether to concentrate or to divide your troops, must be decided by circumstances. Let your rapidity be that of the wind, your compactness that of the forest. In raiding and plundering be like fire, in immovability like a mountain. Let your plans be dark and impenetrable as night, and when you move, strike like a thunderbolt." 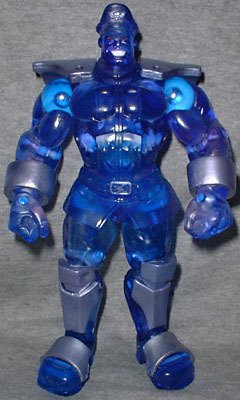 The other figure in this pack is Psycho Bison, a translucent blue version of Street Fighter's main baddie, M. Bison. Leader of a worldwide covert organization that has, at times, been known either as Shadowlaw, Shadowloo or Shadaloo (though only the first one makes any sense), Bison uses high-tech Psycho Drive to channel all the negative energy and emotions of the world into his own personal power source. When it got blowed up real good, so did he - the energy was too much for him to contain, so his body was (for a time) destroyed. When Street Fighter was brought to America, there had to be a few changes made. One of the characters was a boxer named Mike - in SF2, his name was M. Bison. To keep a certain criminally violent professional boxer from suing, the name shuffle began. The boxer became Balrog, the name formerly belonging to the vain Spanish bullfighter that North American audiences would come to know as Vega. Vega got his name from Commander Vega, the main villain, who then inherited the now-meaningless "M. Bison" to call his own. Confusing! The sculpt is definitely accurate to the game - Bison's got his military uniform, complete with the big ridiculous shoulderpads that focus the Psycho drive's energy. At 7" tall, he's bigger than Ryu, even with his slight hunch. He's just as articulated as Ryu, and even the metal plates on his boots move to provide the widest possible range of motion. Unlike Evil Ryu, Bison's got an accessory - a clear stand supports an 8"-tall fireball in which Bison can stand, to make it look as if he's hovering. It's a pretty cool addition, and definitely helps push this set into the "buy" column. The packaging for this series is pretty cool. The shape of the clamshell calls to mind those old stand-up machines, and the thin cardboard insert with the characters' names looks like the distinctive control stick and six-button layout straight from the arcades. The back of the packaging mimics the character selection screen, complete with shaded, "unlockable" characters (Series 2) and mystery characters (future series). Though it looks a bit plain or even ugly at first, a lot of thought obviously went into the packaging. SOTA really proved themselves fast, and according to president Jerry Macaluso, they're getting a lot of enthusiasm and support for this reheated line. Let's hope that this time, Street Fighter has as long and lucrative a life in plastic as they have in arcades - it's just one more way for the characters to eat our quarters. Does SOTA have their act together or what? Tell us on our message board, The Loafing Lounge.